See also our original feature on the song, here: White Christmas. The recording features a very ambitious arrangement. A couple of voices appear to come in too early on the word “dreaming” in the initial line of the first section of the chorus, immediately following the introduction. 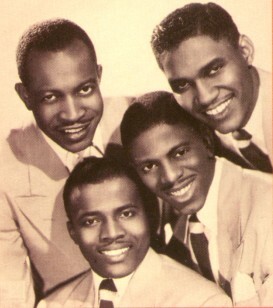 Eugene Mumford joined the group in 1952, according to Wikipedia. When the Quartet revived their career in 1955, touring Europe for the first time and becoming widely popular, Clyde Wright had replaced Mumford. 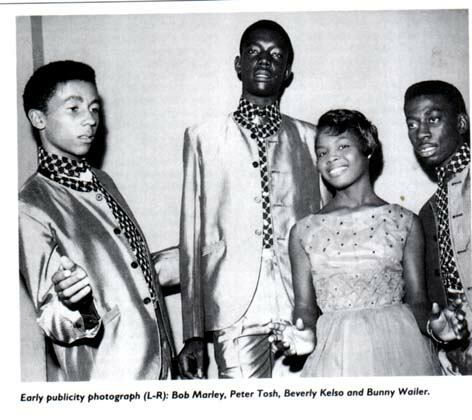 Wright remained with the group until 1971. Chart data provided by Music VF suggests that the original release peaked at #5 on the Billboard R&B chart in 1955, and failed to enter the pop chart, but that upon reissue in December 1955 it did better: #2 R&B, #80 Hot 100. The recording features lead vocals by Bill Pinkney and Clyde McPhatter. 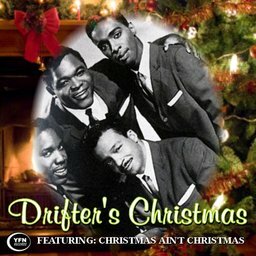 The Drifters were back in the studio on February 4 **, to record another four songs: “Bells Of Saint Mary’s,” “White Christmas,” “Honey Love,” and a third version of “What’cha Gonna Do.” I have no idea why a Christmas tune was recorded in February. Possibly Atlantic envisioned an uphill battle with songwriter Irving Berlin for permission to release it. Ahmet Ertegun and Jerry Wexler were actually worried about how Berlin would react to it, so a dub was brought to him. To everyone’s surprise, Berlin was quite pleased with the recording. (And why not? He only stood to make more money off it.) 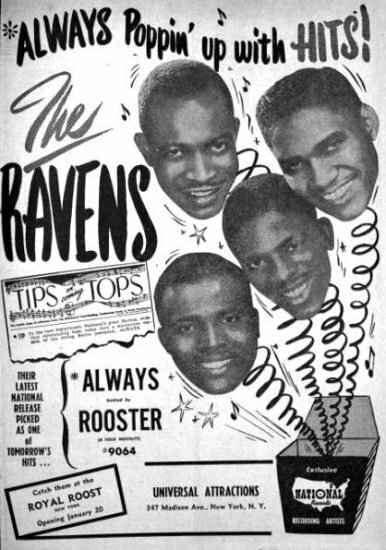 Note that on “White Christmas,” Clyde shares the lead with Bill Pinkney, in an arrangement reminiscent of the one the Ravens had done for National back in 1948. According to the provider of the first video below, the recording appeared on the 1962 compilation album Fortune of Hits, Vol. 2, Fortune LP-8012. 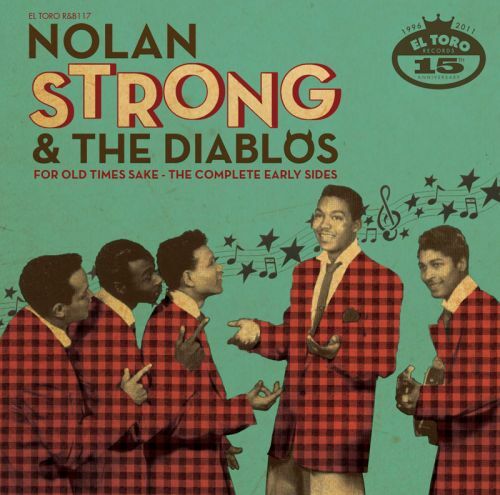 The recording of “White Christmas” by Nolan Strong & the Diablos released in 1974 on Pyramid 159, b/w “Danny Boy,” long after the group disbanded, is likely a reissue of the earlier recording. * The provider of the video featuring the recording by the Golden Gate Quartet that I’ve included above dates the record 1975, but the label displayed in the video is that of the A-side of the single Apollo 45-1204, which was issued c. 1953, though it may have been reissued in 1975. The Apollo Records Story at bsnpubs.com indicates that Apollo continued to release 45s until sometime in 1959 when issues ceased for a period, resuming in late 1960, though “Many of the records issued during the 1960-1962 period were reissues of earlier records. In the numerically ordered 45 rpm discography for Apollo Records at Global Dog Productions, Apollo 1204 (dated 1953) has the highest catalog number, and it’s therefore the last item on the list, though there are numerous other records dated later. That fall , he returned to the Paris-based Golden Gate Quartet, joining Wilson, Riddick and Franck Todd. He participated in seven sessions with them for Pathe Marconi, the French arm of EMI-Columbia in October and November, 1960. Among the sides recorded were “White Christmas” and “Rudolph The Red-Nosed Reindeer” (issued on a bootleg Apollo single in the 1970s), the ethereal “Deep River” and “The World Outside (Warsaw Concerto).” The Gates’ recordings with Mumford were issued on numerous LPs, singles, and, later, CDs, in nearly every European country. 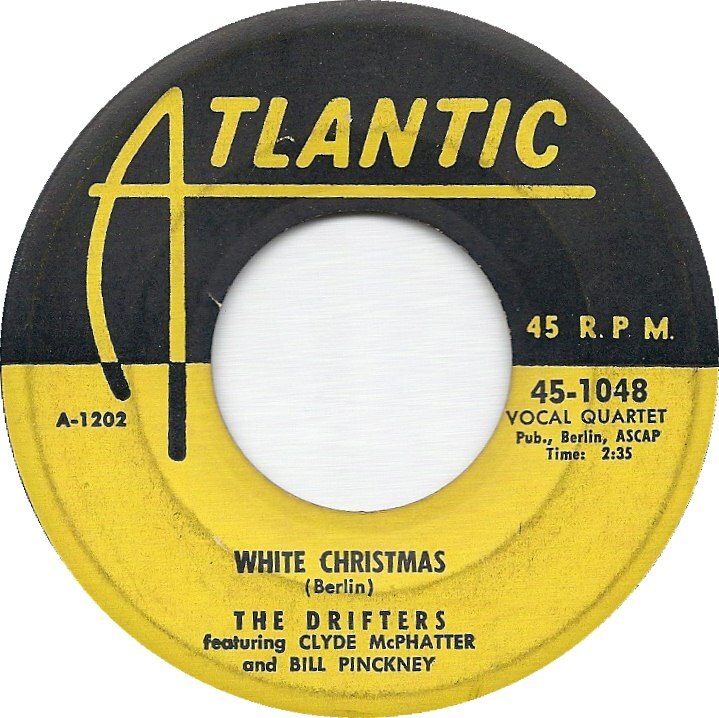 ** On the recording date of the Drifter’s version: A page at the 1950s Groups Page (johnnyspencer.info) disagrees with the date given by Marv Goldberg, claiming instead that the session which produced the recordings of White Christmas, The Bells Of St. Mary, Honey Love and Whatcha Gonna Do took place in November 1953. My money’s on Unca Marvy. 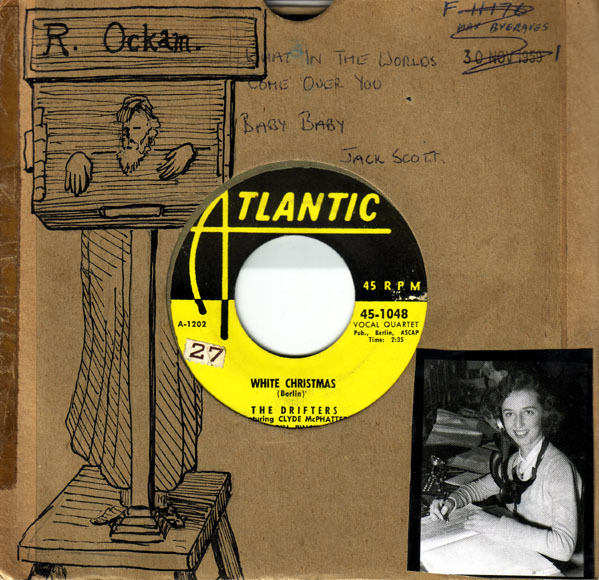 Incidentally, the “1950s Groups Page” is my source of the photograph of the disc with the pen and ink illustration on the brown paper sleeve.